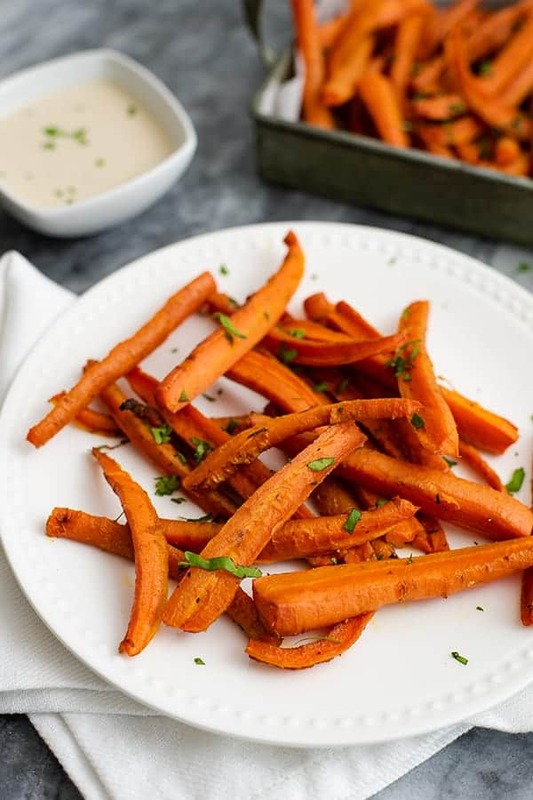 These spicy curry oven baked carrot fries with lime cilantro tahini sauce are going to become one of your favorite side dishes if you like things on the spicy side! 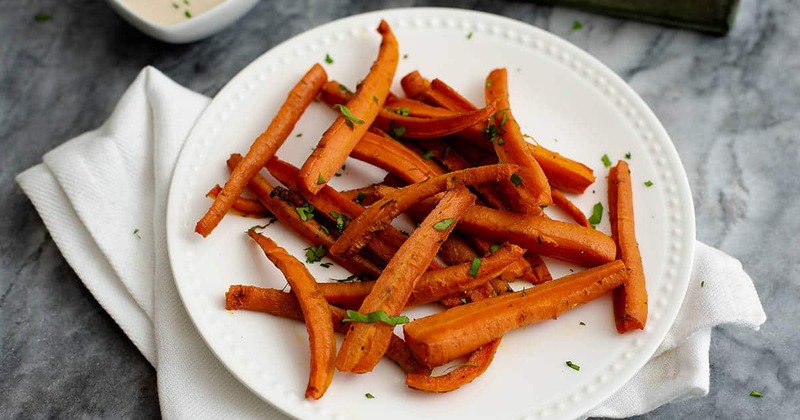 The sweet carrots become the best fries and pair perfectly with the spicy curry powder topping. These fries are gluten free, grain free, paleo, Whole30, vegan and lower in carbs than traditional fries! Carrot fries have pretty much become a thing around here. I even made them for my parents and they were like “these taste better than sweet potato fries”. 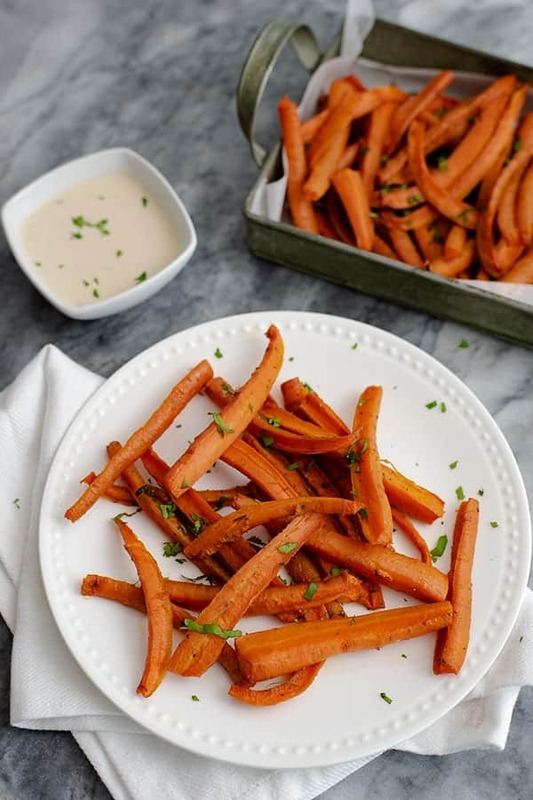 So yeah, oven baked carrot fries are now my “go to” when it comes to simple side dishes that are sure to impress people. Needless to say, I’ve been playing around with the recipe and really wanted to kick things up a notch in the flavor department. 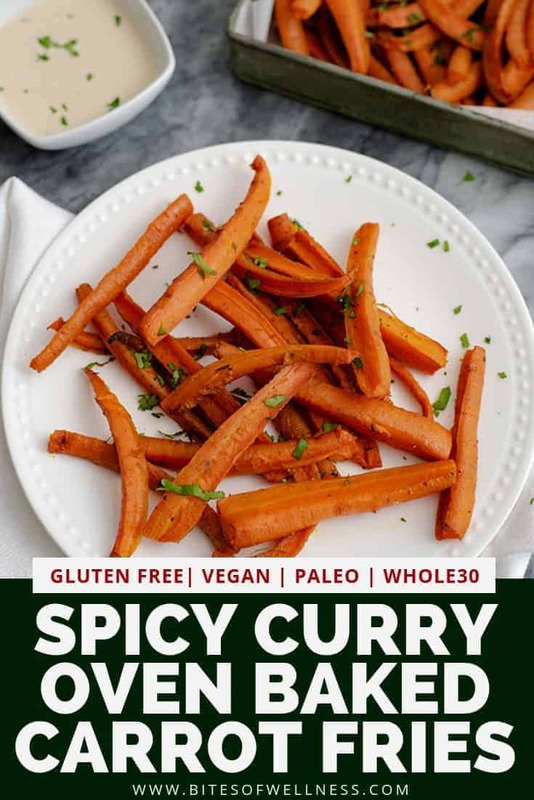 I saw a recipe for curry spiced sweet potatoes and knew I wanted to replicate the flavors with my beloved carrot fries! And it was BEYOND amazing. Honestly, I ate through the entire recipe in one morning. I barley had enough of these spicy curry oven baked carrot fries to take proper pictures for you all. Usually I start by cutting the top and bottom off the carrot and then dividing the carrot in half to create a top and a bottom. Then I take one of the halves created, and cut that in half from top to bottom long wise, creating two long half moon shaped carrot pieces. Take one of the half moon shaped pieces and cut it either one or two times (depending on how thick it is) from top to bottom long wise to create carrot spears. I repeat this process with the rest of the carrot. Most carrots I get between 8 and 12 “fries”. Once the carrots are cut down into fries, I add a silicone mat or parchment paper to a rimmed cookie sheet. Spray the silicone mat/parchment with non-stick spray and add the carrots. Sprinkle the seasoning over the carrots evenly and toss with clean hands or a large spoon. After tossing the carrots, be sure to try to re-distribute them on the cookie sheet so they can cook evenly. Bake in the oven in high heat (425F-450F) for 20-3o minutes, stirring at least one time. 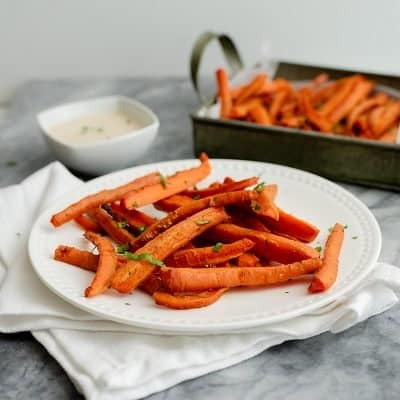 For these spicy curry oven baked carrot fries, I made lime cilantro tahini sauce to pair them with. Although these would be great with ketchup, this sauce really takes these fries to the next level. 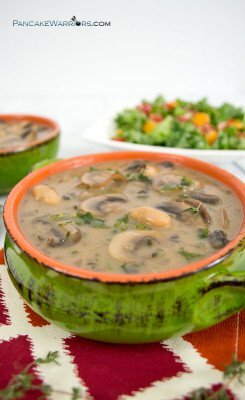 I highly recommend the tahini dip if you are trying to make a good impression on company or if you are looking for an extra special weeknight meal. The best part is that the sauce only takes a minute to make! Tahini is made by grinding up sesame seeds. Sesame seeds are a great source of zinc, iron, manganese, magnesium, copper and calcium. Grinding the sesame seeds into a paste make them easier for your body to digest. Sesame seeds are also high in the amino acid methionine, which is a natural detoxifier, which helps keep your liver healthy. 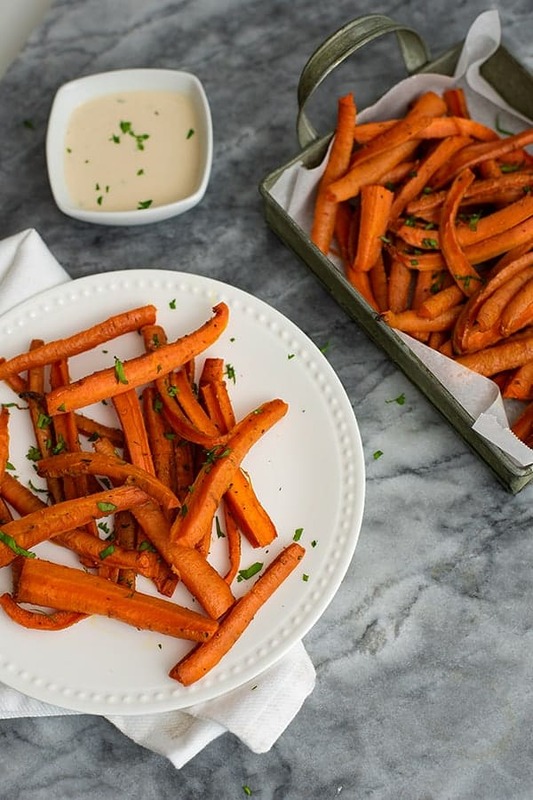 These spicy curry oven baked carrot fries are fancy enough for company but easy enough to be the perfect weeknight side dish. 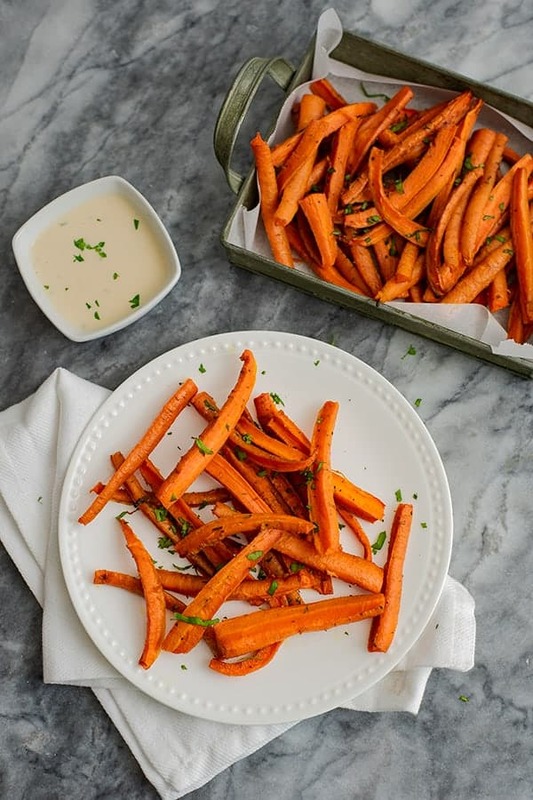 Served with a simple lime cilantro tahini dip, these carrot fries easily become a decadent meal! 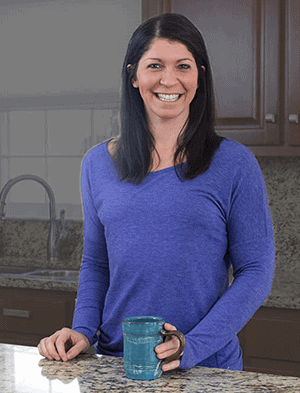 Vegan, paleo, Whole30, gluten free, grain free, allergy friendly and lower carb! Add the carrot fries, curry seasoning and 1/2 tsp. salt. Stir well with your hands or a large spoon. Try to get the carrots into one even layer, it's ok if they overlap though. Remove from the oven and let cool slightly. Make the lime cilantro tahini dip. 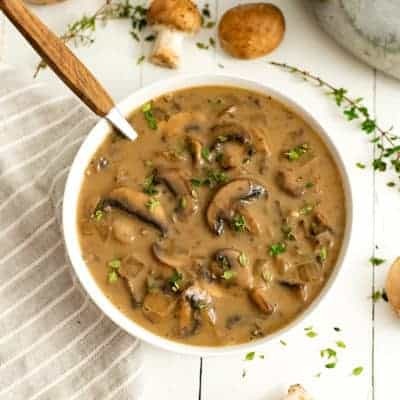 In a small bowl, combine all the ingredients and stir well until combined.